Admission: All ages are welcome. Accepting cash, credit, and debit. Students, Military, GT faculty, ADJPS $5 with ID. General admission $10. Dress: Comfortable clothing and shoes. Typical Friday night attire. Please wear shorts underneath skirts and dresses. Amenities: Water fountains and restrooms are available. Vending machines are downstairs. Free Lesson: Our beginner lesson is at 8pm and our intermediate dance practice is at 8:30. Please be timely! Friday, February 15, 2019 Peachtree Jazz Edition Go back a century for one night and swing dance with us! We’re having big band Peachtree Jazz Edition over to celebrate the sounds and sights of the 1920s. This dance features a costume contest, a Charleston competition, a photo booth, and prizes. Friday, January 18, 2019 Gwen Hughes and the Retro Jazz Kats This January, warm up at our next swing dance! We’re looking forward to live music by the talented Gwen Hughes and the Kats. See you soon! Friday, December 7, 2018 DJ Jim Wheatley’s Vinyl Experience Get hip to vinyl with DJ Jim Wheatley! We’ll show you how to dance swing. 50s, blues, jazz, and Motown music included. Friday, November 16, 2018 Tongue in Cheek Jazz Band Get up and swing dance before the holidays begin! We’re welcoming Tongue in Cheek Jazz Band from Baltimore and can’t wait to hear them live. Join us for our free beginner lesson at 8pm or our intermediate practice at 8:30pm. Friday, October 5, 2018 Band TBA It’s the GTDA Halloween swing dance! Wear a costume* if you have one and get your picture taken at the photo booth. Join us for our free beginner lesson at 8pm or our intermediate practice at 8:30pm. Friday, September 21, 2018 Harlequin Jazz Band Get ready for the last swing dance of the summer… The Harlequin Jazz Band will be here to provide live, entertaining music! Also, please join us for our free beginner lesson at 8pm or our intermediate practice at 8:30pm. Friday, August 31, 2018 Capital City Xpress Swing dance with us! We’re hosting our first monthly dance in the Student Center Ballroom on August 31, so take our free dance lessons at 8 and 8:30 pm and stay for the social dance! Featuring live jazz & swing music by Capitol City Xpress at 9 pm. 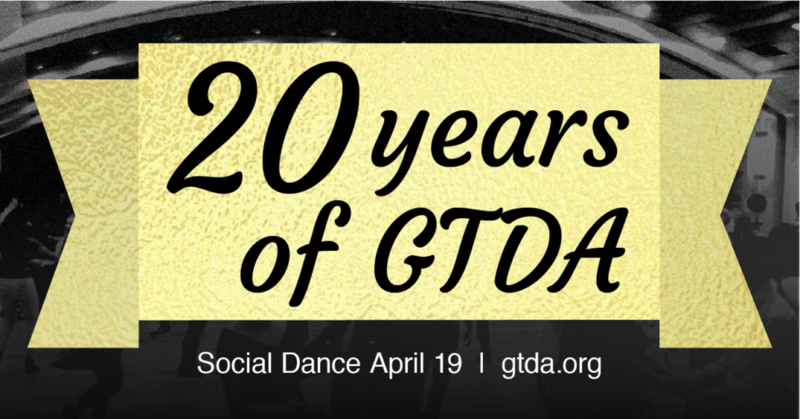 Friday, April 20, 2018 DJ Malon Fripp This will be our normal April GTDA dance. Friday, January 19, 2018 Peachtree Jazz Edition Masquerade-themed dance: masks are desired but not required. Friday, October 20, 2017 Moonshine Rhythm Club Halloween costumes encouraged! Friday, April 17, 2015 Cancelled Due to venue availability, we will not be able to offer a dance this month. Friday, March 13, 2015 Capitol City Xpress This dance will be St. Patrick’s Day themed so be sure to wear green! Friday, October 31, 2014 Snorky’s Rhythm Kings Part of Atlanta Varsity Showdown! Friday, May 16, 2014 Band TBA We will be taking a break for the month of May while the Student Center installs a new, hardwood ballroom floor! Friday, October 25, 2013 Perseverance Jazz Band Halloween Dance!! Also, part of the Atlanta Varsity Showdown! Friday, July 19, 2013 DJ Jim Wheatley Vinyl Experience (back for the fourth year)! Friday, September 21, 2012 One Leg Up Double Header! A part of the Jubilee Jazz Revival! Friday, August 24, 2012 The Savoy Kings Back to School Dance! A part of the Sweet Georgia Blues weekend event! Friday, July 20, 2012 DJ Jim Wheatley Vinyl Experience! For the Third Year in a ROW! Friday, July 22, 2011 DJ Jim Wheatley Vinyl Experience! Saturday, April 4, 2009 Kingsized GTDA presents ATLX 6. GT Students: $5. All others: $25. Visit www.atlx.org for more information. Friday, September 14, 2007 Bonaventure Quartet and Hotlanta Dixieland Jazz Band GTDA is proud to present the Southern Belle Swing Bash 2007 Please note that the Friday night dance is $15 for everyone. Friday, September 22, 2006 Gwen Hughes First dance for incoming freshmen. Saturday, August 26, 2006 TBA Yes, it’s on a Saturday. Saturday, July 15, 2006 TBA Yes, it’s on a Saturday. Friday, May 26, 2000 West / Jim Wheatley / David Rothenberg Battle of the DJs!! !